Doctor petitions N.H. state legislature and other officials to help return two daughters who he feels were abducted through social services to a Swiss psychiatric ward and a German-speaking foster care group home. 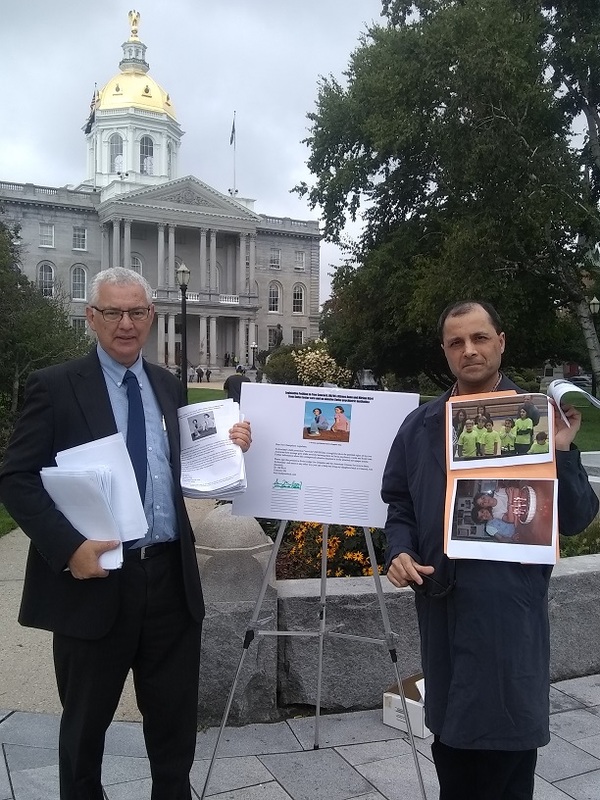 CONCORD, N.H., September 17, 2018 (PressRelease.com) – Dr. Hil Rizvi and psychiatric watchdog Citizens Commission on Human Rights got seven New Hampshire state legislators to sign a petition Thursday morning urging a Swiss judge to return custody of his two US-born teenage daughters who are being involuntarily confined in a Swiss in-patient psychiatric ward and foster care, while several other legislators promised to further investigate the situation while contacting Swiss officials. As covered in a six-part series in a Boston conservative newspaper, social services claimed medical neglect against Rizvi for not fully going along with the girls' eating disorder treatment plans that included involuntary commitment and a powerful antipsychotic for his younger daughter. Dr. Rizvi claims that his daughters have been targeted through social services due to his work in protecting doctors who have spoken up against cost-cutting hospital policies that he feels puts patients at risk. The Rizvi case goes back several years. According to Dr. Rizvi, both girls were doing well in school with several friends in Maryland when taken to the mother's home country of Switzerland and put in psychiatric wards. It was a coordinated effort of social services in Maryland and Switzerland. Rizvi and his wife fought together to get the younger girl returned. Rizvi said that his older teen did not get returned as she had gone along with authorities to stop demanding a return home in order to get out of a psychiatric ward and into a less abusive German-speaking foster group home. After a lot of stress, Dr. Rizvi moved to Concord, New Hampshire with the younger girl while his former wife moved back to her home country of Switzerland. While agreeing to what Rizvi thought was to be a short visit to a Cambridge, Mass. eating disorder center, they decided to involuntarily commit his daughter and put her on an anti-psychotic at a dosage that Rizvi refused. Shortly after, in October 2016, Massachusetts social services went to court and gave a five-day custody order to the mother to bring the girl back to Switzerland wherein the girl was immediately locked and drugged in the psychiatric facility. She still remains there and Swiss social services has taken parental rights away from both parents. The girl is a New Hampshire citizen who has always lived in the United States, but never in Massachusetts and her only connection to Switzerland was through her mother.